Mathematical theory behind personal imaging is in main research papers page (not included again on this WWW page). How to build a version of the WearComp for under $400 if you already have a laptop computer. The chirplet transform (a generalization of the wavelet transform), developed for personal imaging applications such as wearable radar (e.g. the Blind Vision project, etc.). 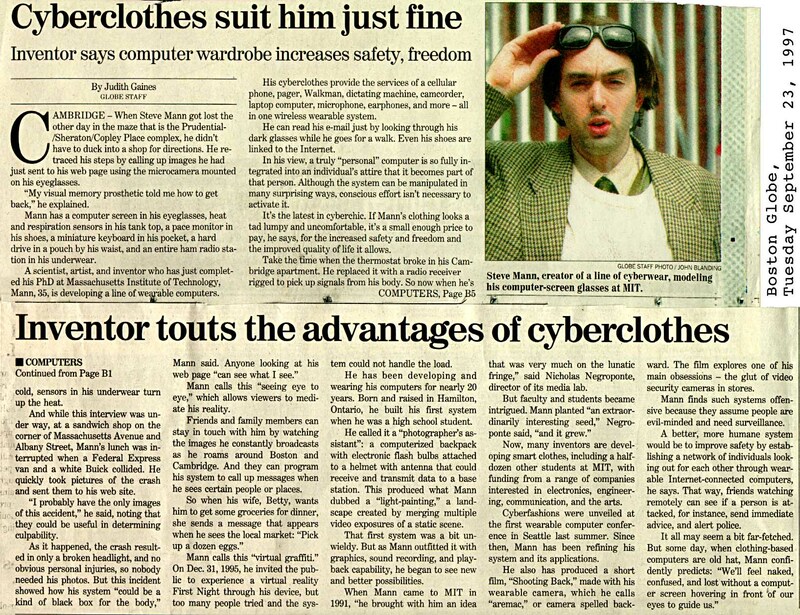 An historical account of the WearComp project. (This paper may also be viewed as one single html file, or a PostScript version may be downloaded). Wearable Wireless Webcam and the personal visual assistant. 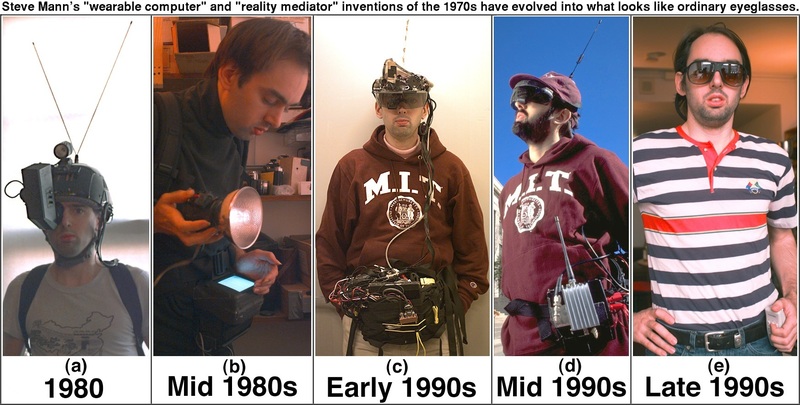 On the bandwagon, a sober look at the recent wearable computing hype. If you're in the MIT area, you might also want to look at Steve Mann's ShootingBack exhibit in the List Visual Arts Center (LVAC), located on the first floor of building E15, which also houses the Media Lab, located at 20 Ames Street, Cambridge, MA. There, on display, are some embodiments of his "WearComp"/"WearCam" invention selected from the 100 or so units he's built over the last 20 years. The few units that were selected for the show are those that are most relevant to issues of surveillance in society (re-situating the video camera in a disturbing and disorienting fashion in order to challenge our pre-conceived notion of surveillance in society). WearComp empowers the individual who would be otherwise vanquished in the face of large hegemonic organizations. Ontario Centres of Excellence show (depicting evolution of Mann's WearComp invention over the last 20 years) to appear, Ontario Science Centre, Feb. 28 to Mar 9. Special thanks to Ted Kawana and Bruce of the Ontario Science Centre for help in the set design, to Engineering Week, http://www.peo.on.ca/neweek/new.htm, in particular, Judy Saurette, for funding the purchase of the mannequins for the exhibit, and hosting it as part of Engineering Week. Thanks also to the Ontario Centres of Excellence, http://ontcentex.org in particular, Sharon Airhart, as well as Grey Interactive, http://grey.net, in particular Dougal Bichan, for coordinating this effort.